Looking for a hair color spray for Halloween, or other fun events like color runs and parties? 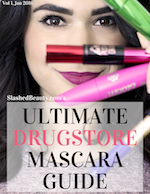 It’s the easiest way to add temporary color, but not all sprays are made alike. As a brunette, I’ve tried many that just aren’t made for dark hair. A lot of sprays work best on blond hair, and only give a slight tint to anything darker than medium brown. 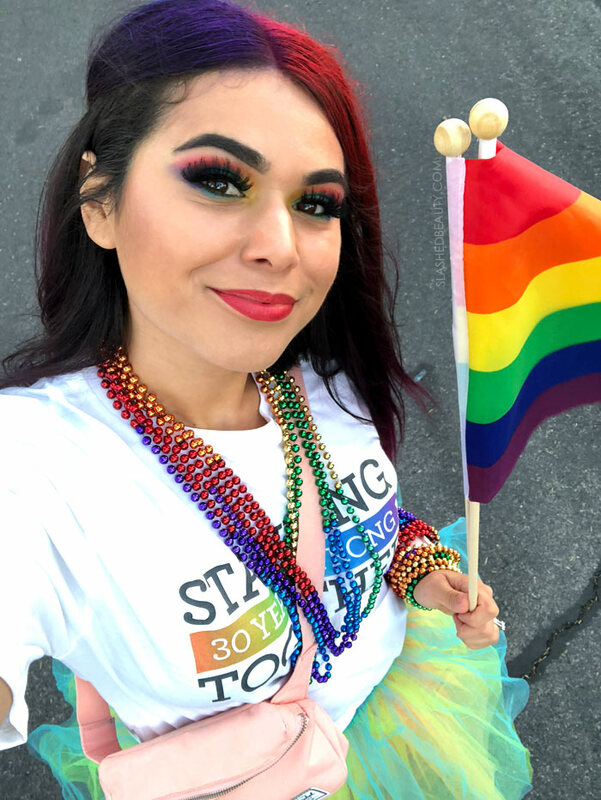 I recently had the opportunity to walk in the Las Vegas Pride Parade, which was so exciting and of course I wanted to incorporate as much color as possible. 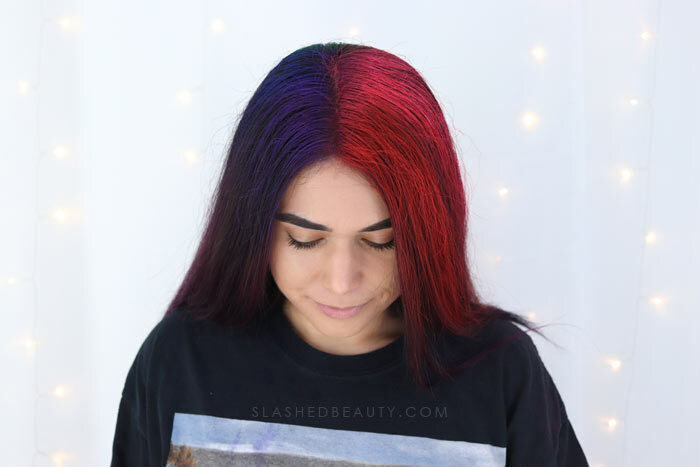 Even though my hair is already purple, this was the perfect opportunity to temporarily add even more bright shades! 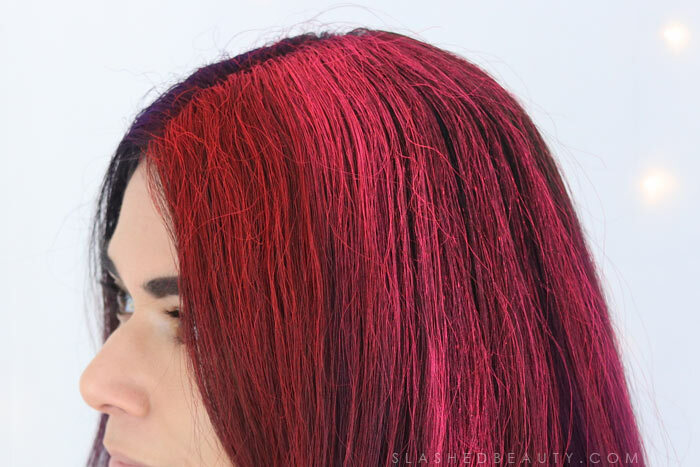 I had the brand new Manic Panic Amplified Temporary Hair Color Spray lying around for a couple months, waiting for an excuse to be used, and this was it. Manic Panic is known for their vibrant bright colors, so I had really high hopes. They claim that this spray works on all hair types and color levels, from light to dark. The spray currently comes in seven different colors plus one glitter spray, but I only used five for my Pride hair color: Wildfire (red), Pretty Flamingo (pink), Electric Lizard (green that also glows under blacklight), Rockabilly Blue (blue) and Ultra Violet (purple). While most of my hair is purple, it’s a balayage look so my roots are still my natural color, which is a very deep brown… some people mistake it for black. 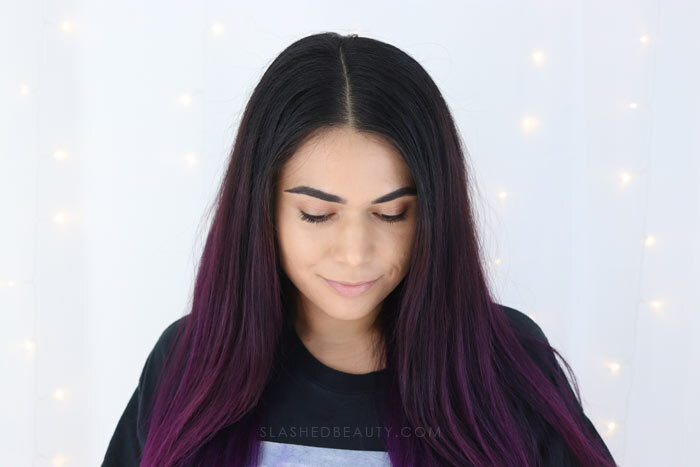 My plan was to do a reverse ombre with the spray, adding the color to my roots and have it fade into my purple color. The first thing I noticed with this spray was that there’s no easing into it. It comes out really fast and strong, so definitely be sure to apply at least 12 inches away from your hair to get a more even coverage. Even still, I was surprised with how much color comes out in one shot. 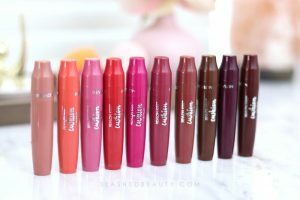 This is not a color you can really build up— it’s pigmented and it’s proud of it. With that said… yes, this shows up on dark hair! I was so surprised with the red and pink, because it looked just like the can’s top. In fact, all the shades showed up extremely well. Even the dark colors looked really bright at my roots, which I was probably even more surprised about because there’s not a lot of contrast with my natural hair. This is hands down the most pigmented hair color spray I’ve ever used. With that said, there were a few factors that made this spray a hassle. The first and probably most annoying being that this spray does have a considerable amount of transfer to it, moreso with the red and pink shades. With that said, it does wash off skin extremely easily with regular soap and water. I used bleach spray to get residue off of my counters. But if you’re spraying pieces of your hair that touch your face, the color will rub off onto your skin. That’s pretty irritating if you’ve already done your makeup, or have to keep touching it up because you notice red streaks. If you’re like me, and sometimes mindlessly touch your hair, you also might not notice the color coming off onto your fingers, and then it’ll end up on your keyboard, all your doorknobs and light switches. I speak from experience. Even though the color shows up extremely well on dark hair, I will say that the end result does look a little piece-y or wire-y. You’re supposed to use this spray on dry, styled hair as a last step, and it’s clearly not going to coat all the layers of your hair rather than sit on the surface. So as your hair moves around, you’ll start to see the separation and your natural hair color come through the color. 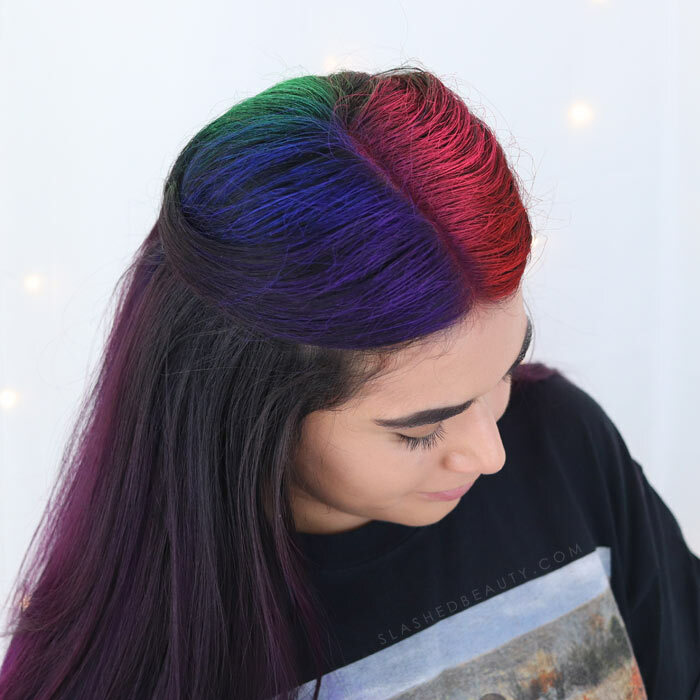 In my opinion, it ends up looking kinda chunky and cake-y when your hair is down, so I think this spray works better if your style is in a style that won’t cause a lot of movement of the colored part. I originally sprayed while my hair was down, but ended up pinning back the top section and re-spraying for a more even look. Again, as this is a hairspray, it does stiffen the hair the more you spray it. This is another reason why I feel it’s best on styles other than just wearing your hair down. With that said, you can break up the hair a bit with a wide tooth comb, but be mindful as that can also take a bit of color off. The other thing: the smell. It smells like real spray paint and it doesn’t quite fade off even after a few hours of having it in your hair. So it’s not something I would use every day due to the mess (the brand also advertises it as being useful to touch up roots between colors… no thanks), this spray is still the best I’ve tried for when you want to add funky color just for one night. The spray shampoos out, and I didn’t notice any residue left over after my shower. If you have lighter hair, a clarifying shampoo would work best. 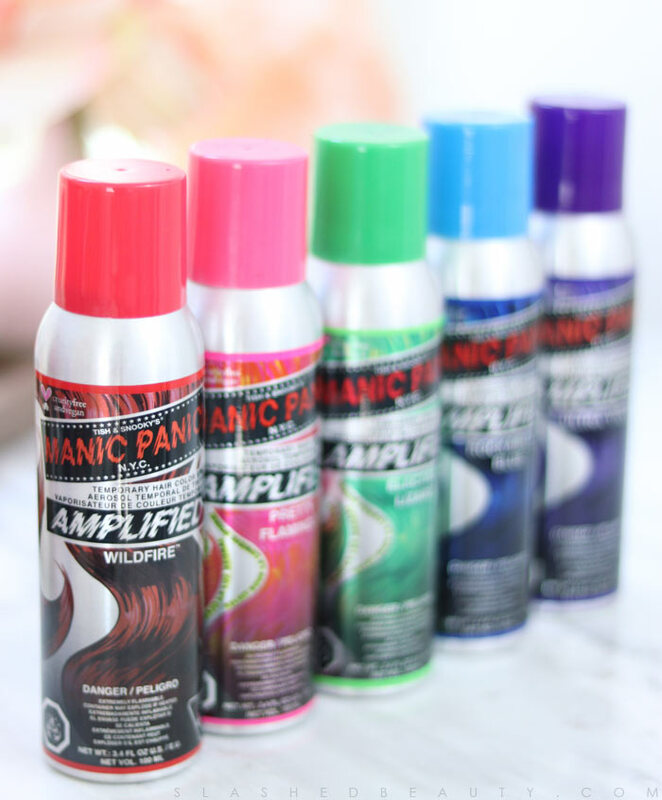 Right now you can find the Manic Panic Amplified Temporary Hair Color Spray on the brand’s website. What other events do you use temporary hair color spray for?